Mulberry, mulberry, mulberry. 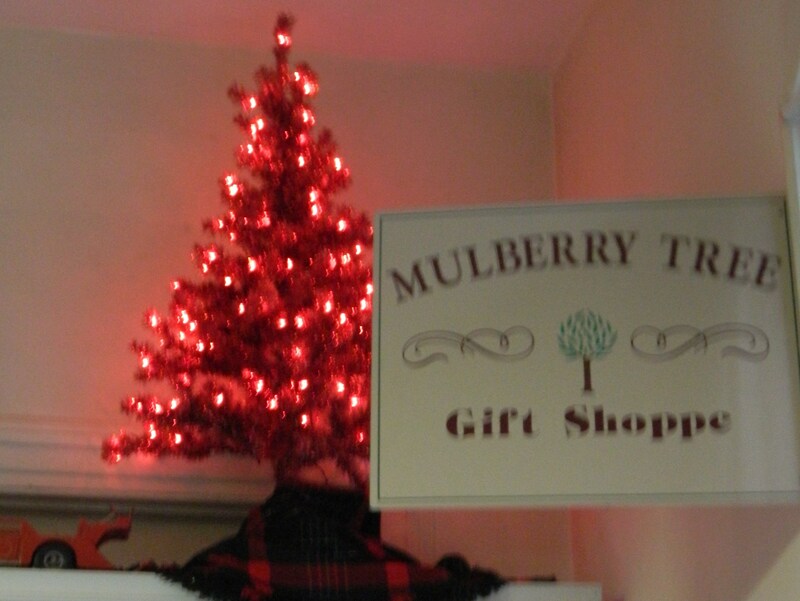 A Mulberry tree is the centerpiece of Manchester, Connecticut’s town seal, Mulberry Street Pizza or “The Mulb” is a popular downtown restaurant and a “Mulberry Tree Gift Shoppe” sign greets visitors to the Old Manchester Museum. So what’s the connection between Mulberry and Manchester? 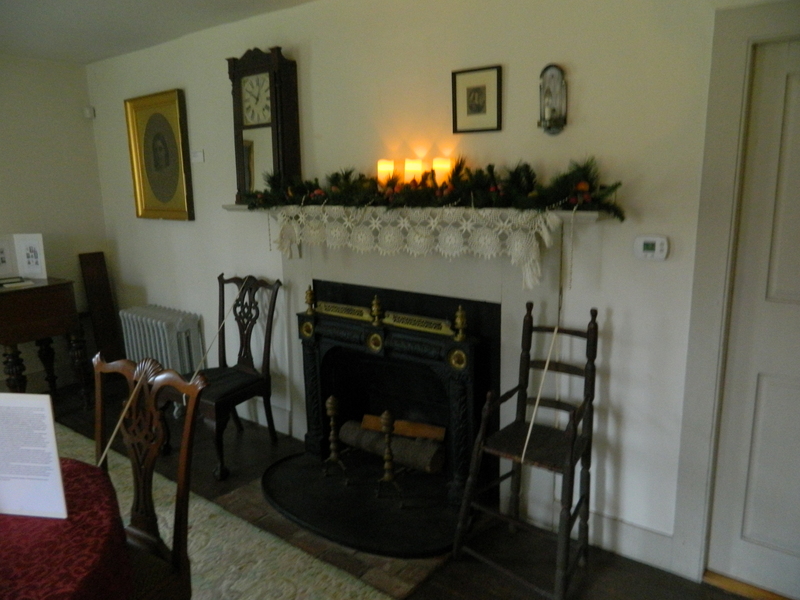 David Beal of the Manchester Historical Society hosted a holiday tour of the Cheney Homestead in Manchester, Connecticut. 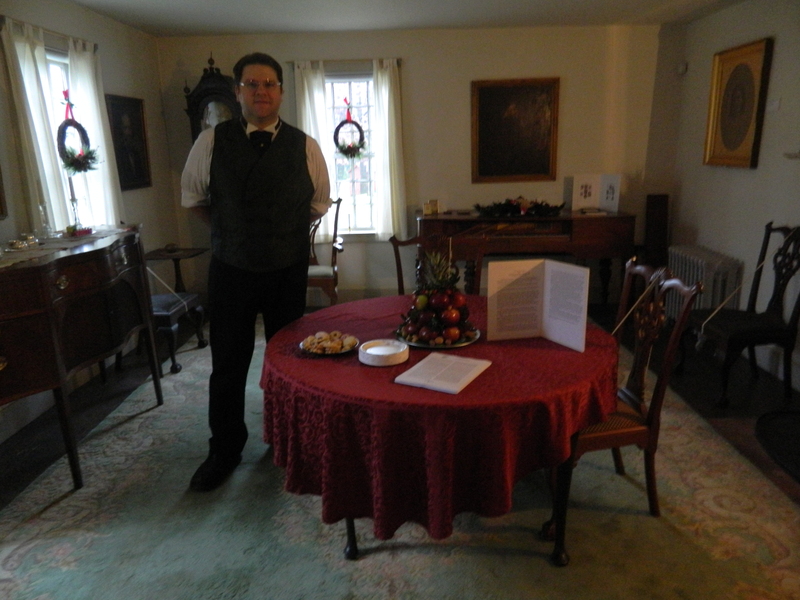 “A lot” David K. Smith, curator of the Manchester Historical Society, Inc. said during a holiday open house held December 6 throughout the town’s Historic District. “Silkworms would only eat Mulberry tree leaves,” Smith continued. The Cheney Brothers sought out Mulberry trees to bring to Manchester. Today they abound here, said Smith. Even so, he noted, it was years before Manchester had an actual Mulberry road. Finally, Smith said, Andrew Ansaldi, a well-known local builder put the namesake road in at one of his complexes. More holiday decorations at the Cheney Homestead. A donated Jacquard Loom is part of the “Loom Exhibit”. The Cheney Family and their silk mills had a profound impact on the growth and development of Manchester. Currently beautifully adorned for the holidays by the Manchester Garden Club, the Cheney Homestead is a focal point in the Historic District. The Manchester History Center on Pine Street is located inside an old Cheney mill building, the former Machine Shop. Construction on the Machine Shop, which was done in phases, began in 1895, according to the “Courier” – the MHS, Inc. newsletter. In 1999, the old Machine Shop was purchased by the historical society. 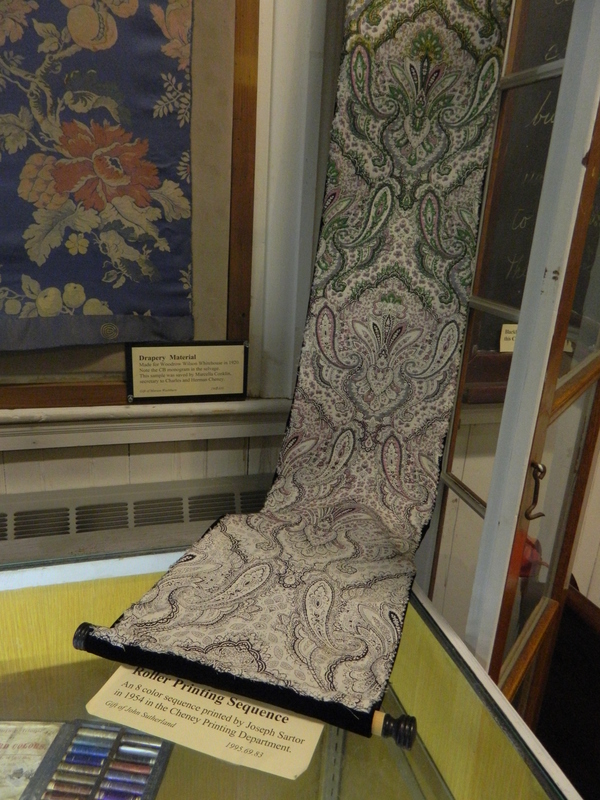 It houses their administrative offices, a museum store and on the lower level – the “Loom Exhibit”, a work in progress aimed at calling attention to the place the textile industry had not only in the history of Manchester but in American history. During a tour of the “Loom Exhibit”, MHS, Inc.’s Dennis J. Gleeson explained that the Machine Shop is where looms were repaired. 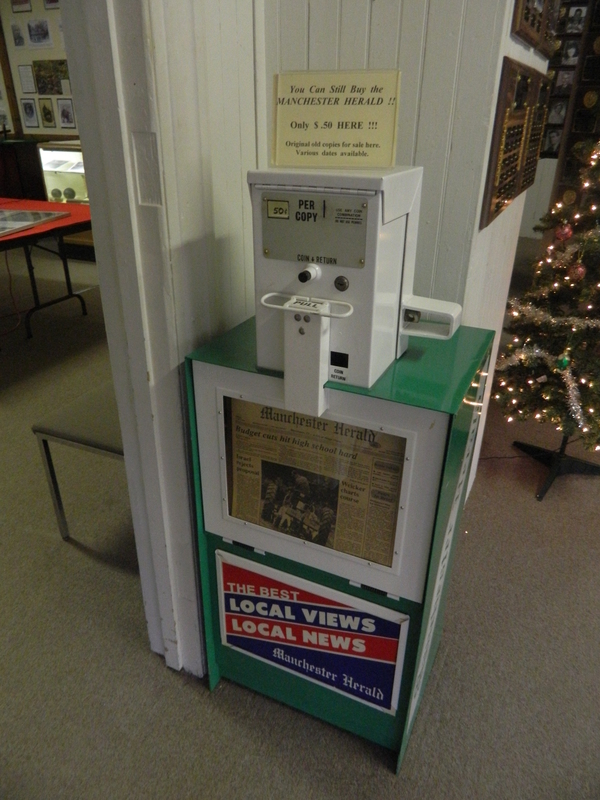 It was noted in the “Courier” that students from the Howell Cheney Technical School have helped with various phases of work done at the Machine Shop for the exhibit such as installation of wiring for the looms. 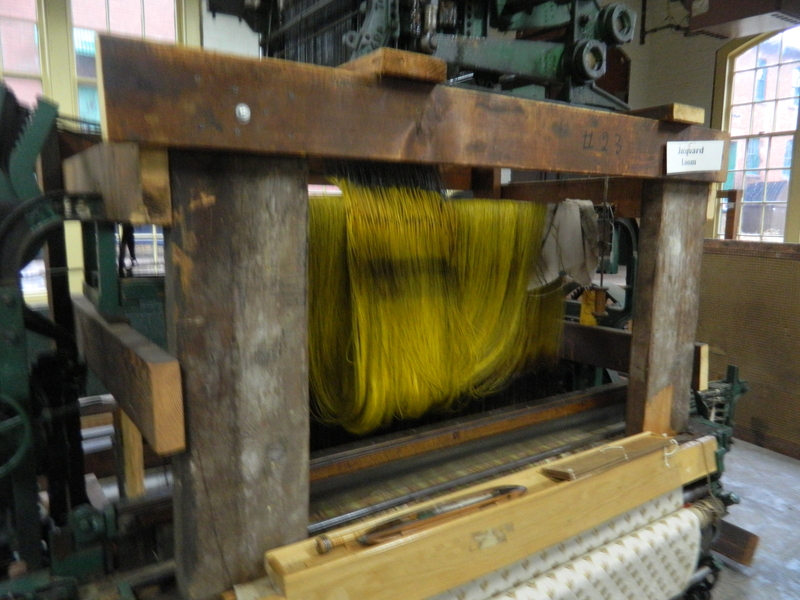 These are donated looms and among them are two large Jacquard Looms. 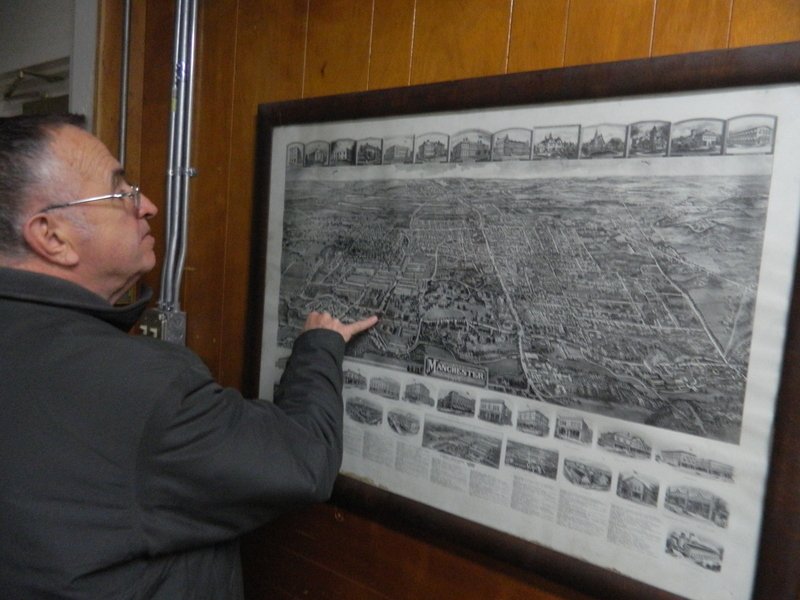 During a tour of the “Loom Exhibit”, Dennis Gleeson shows a map depicting the impact the Cheney Brothers silk mills in Manchester, CT had on the growth and development of the town. 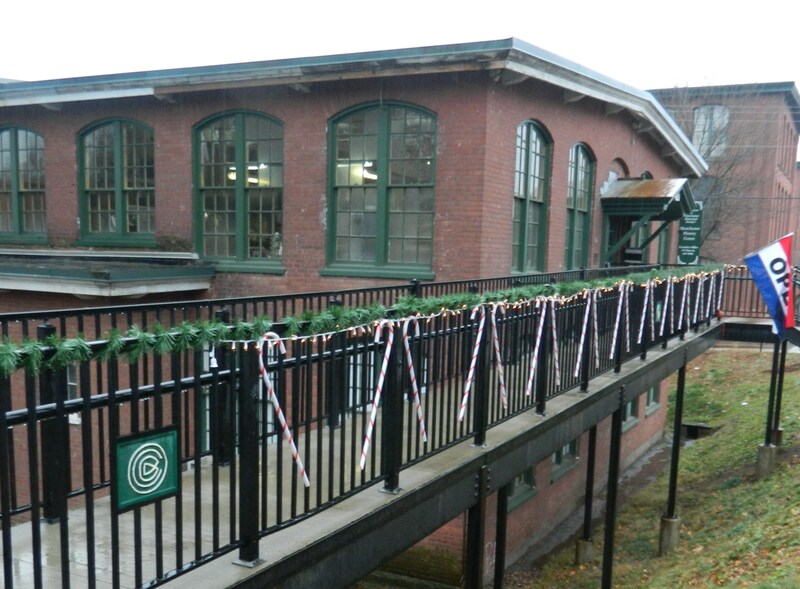 The Manchester History Center is located inside the former Cheney Brothers Machine Shop housing a museum store, MHS administrative offices and the Loom Exhibit – the old silk vault is also here. The former Cheney mills had several free-standing factory buildings, such as the Ribbon Mill, Velvet Weave Shed, Dye House, Yarn Mill, Velvet Mill, and the Finishing and Printing plant. Most have been turned into apartments except the latter – there is speculation that it may someday be the site of a library. Now used for storage, silk vaults were installed along the Cheney Railroad in 1919, following an attempted silk heist, Gleeson added. 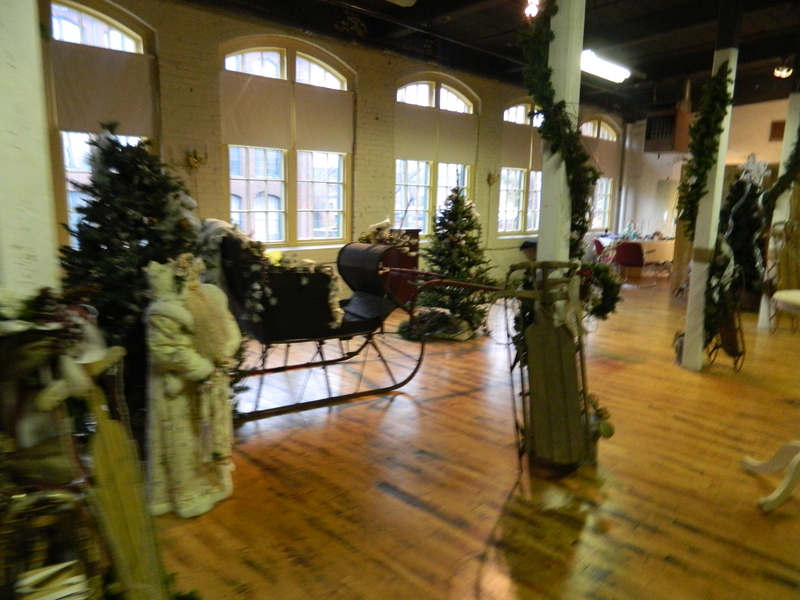 Decorations remained from a successful fundraiser, the Winter Wonderland Gala, held at the Manchester History Center. “At one time silk was more valuable than gold,” said Gleeson. Known for their emphasis on providing education for their employees, Gleeson said the Cheney Brothers had toured mills in Europe and were determined to offer their workers better conditions. Eileen Sweeney, Executive Director for MHS, Inc., pointed out that the Cheney Brothers produced a brochure in five different languages to help recruit workers from Europe. Eileen Sweeney, Executive Director of the Manchester Historical Society, Inc. shows a worker recruitment brochure the Cheney Brothers had produced in five languages. The center is where many of the MHS, Inc. events take place. A “Winter Wonderland Gala” had been held the night before the tour, which Gleeson said raised $20,000 to help the historical society, a non-profit organization. As curator of MHS, Inc., Smith was on hand to answer questions at the Old Manchester Museum on Cedar Street. 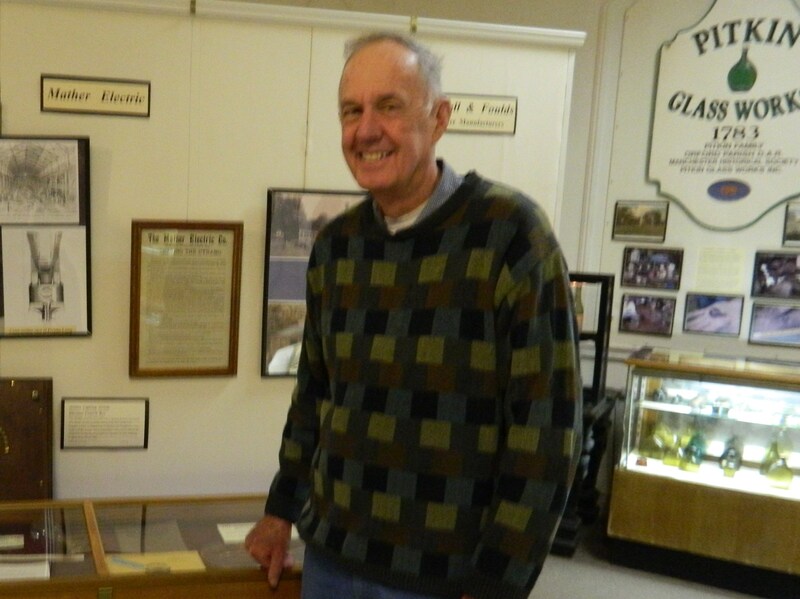 Eventually, he said, the historical society plans to relocate the museum into the History Center. David K. Smith. 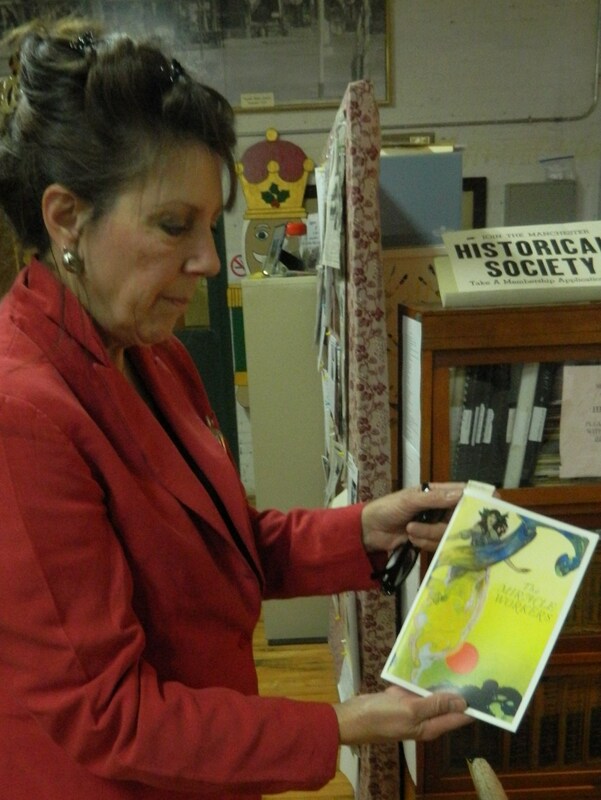 curator of the Manchester Historical Society, Inc. showed visitors around the Old Manchester Museum. 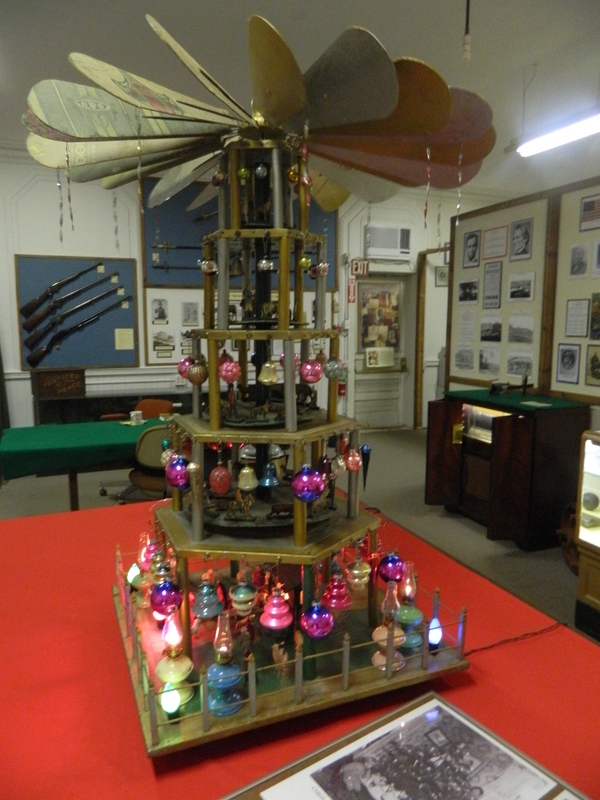 A unique looking holiday decoration on display at the Old Manchester Museum. Histories of the Cheney silk mills, Pitkin Glass Works and more of the previously prominent businesses and industries in Manchester can be found here. 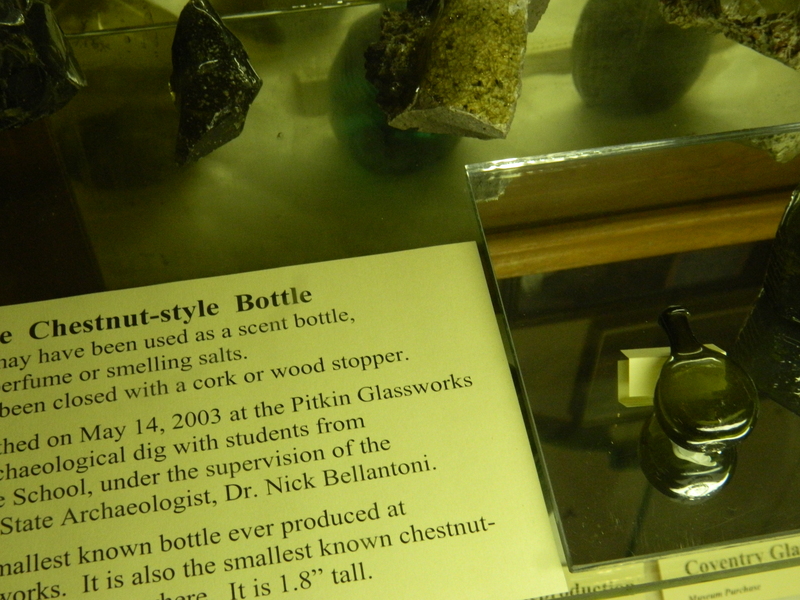 In fact, a small bottle produced by the Pitkin Glass Works factory and discovered by Smith is on display. An intact small glass bottle discovered by David Smith at an archaeological dig at the former Pitkin Glass Works factory site. Smith came across the find while participating in an archaeological dig with local students at the glass factory site, he said. Extra! Extra! Read all about it in the Manchester Herald. Once used to provide music at Shady Glen restaurant. An example of the fine craftsmanship produced by the Cheney silk mills. 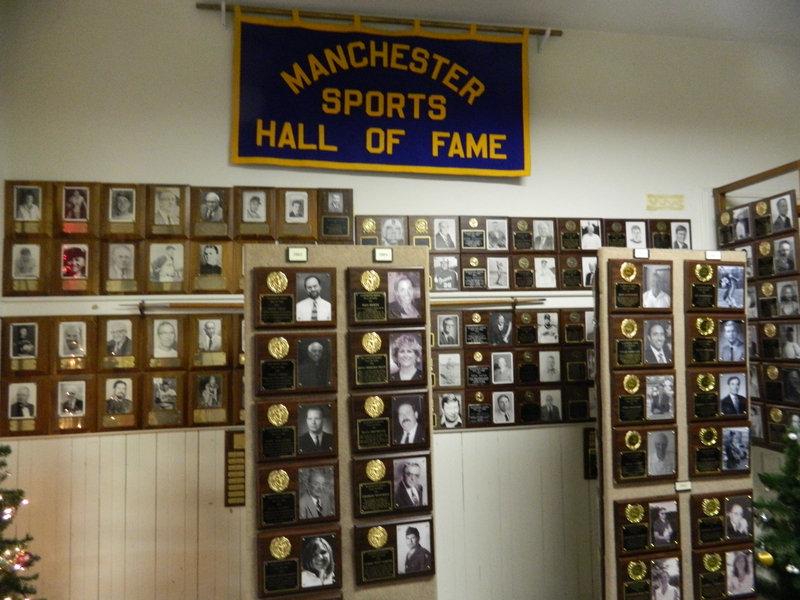 The old museum is also home to the Manchester Sports Hall of Fame. 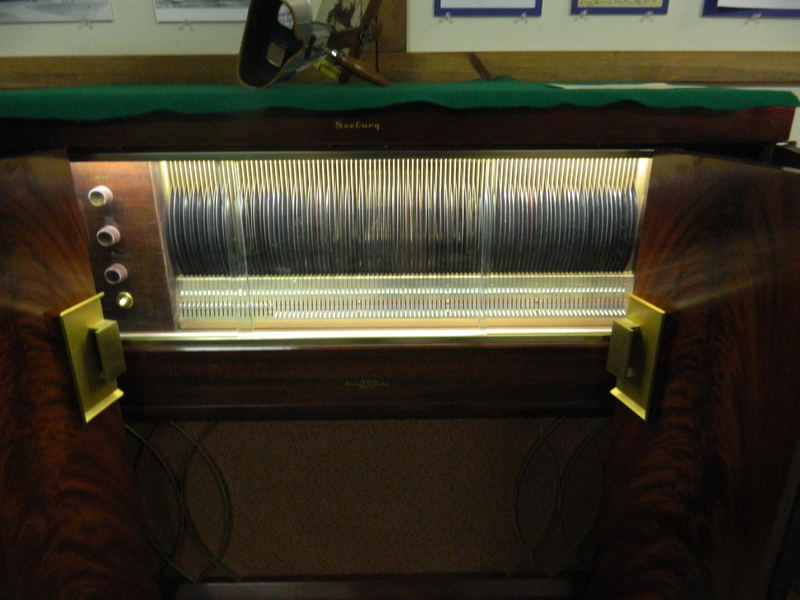 In addition, it has an array of other memorabilia – including a juke box of sorts (it held records played back in the day) for the enjoyment of customers at Manchester’s renown Shady Glen Restaurant, and a “Manchester Herald” paper box from which one can still purchase a “Herald” for 50 cents. And to think, so much of it happened thanks to a Mulberry tree! The Cheney Homestead, 106 Hartford Road (860-647-9983); The Manchester History Center, 175 Pine Street (860-647-9983); The Old Manchester Museum, 126 Cedar Street (860-647-9742). Go to http://www.manchesterhistory.org for more information about tours and hours.